You don’t have to hang out with me long to find out I’m a complete bibliophile. This means that I will stand by books being better than movies until the end of time. In fact, my brother-in-law and I have an ongoing fight because he insists on watching movies before reading the books. He claims it’s because he doesn’t want to be disappointed, he doesn’t know what he’s talking about. But that’s okay because I refuse to let him corrupt his children and I will raise them to be book dragons. This leads me to a new series where I will read the book THEN watch the movie (I’m looking at you, Rhett) and compare the two. 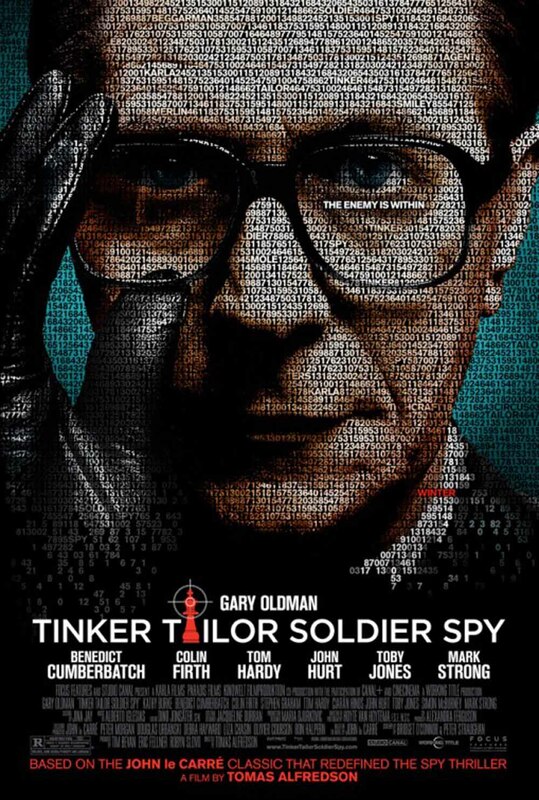 So I chose to kick it off with Tinker, Tailor, Soldier, Spy. Confession, I saw Tinker, Tailor, Soldier, Spy before I read the book and I now present my defense. First, I did not know it was based on a book. Second, it was a long time ago and I was more concerned about wanting people to leave my house than I was the plot line. That being said, I recently discovered there was a book and added it to my summer reading. Let me tell you, I am so glad I did. A co-worker said John le Carre is her favorite author and suggested more books for me to read. I always welcome book suggestions. Let’s get started. I’m going to start with the book review of Tinker, Tailor, Soldier, Spy and then compare the two. Even the style has the feel of espionage. Le Carre is extremely careful not to tip his hand until the end. There is a little confusion with going back and forth between London and a school in the North. As the book progresses, the two storylines come together beautifully. I’m the kind of person who figures out the ending, but I was struggling to pin this one down. However, when he reveals the mole, it was as if I always knew. So who *do* you get to spy on spies? 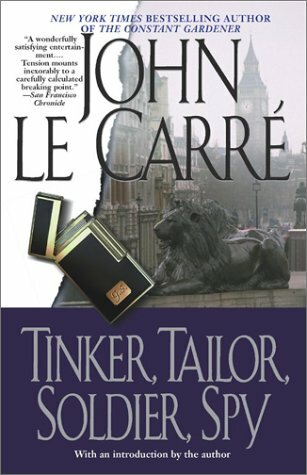 Tinker, Tailor, Soldier, Spy follows an ex-spy, George Smiley, as Lacon pulls him back in to plug the leak. An active agent calls his handler and the minister to reveal a long-standing problem. Tarr gets cozy with a Soviet agent and she tells him about Gerald, the double agent. According to Irina, this spy is high up in the Circus and has powerful connects. This information concerns Guillam, Lacon, and Smiley so they start an operation to smoke him out. Some of Smiley’s connections are still good which allows him to get more insight than your average Joe. Even with this leg up, the reader wonders if he’s getting any closer to his goal. I have to go back to the style before delivering my book verdict. When I say incredible, I mean makes you sit back and sigh beautiful. The intricacies of spying bleed through the text and you know you’re reading a spy novel. The reveal was crazy smooth and fantastically British. No fight scene, no high-speed chase. Pure wit and cunning solved the problem. Be still my beating heart. On to the movie comparison. I have many mixed emotions. On the one hand, most of my favorite British actors are in it. On the other hand, the writers threw the plotline in a blender and reassembled it. Then, just for kicks, they added more. Apparently, Holywood can’t stand any form of loose ends and has to add closure to every character’s story. Sometimes we don’t get everything. Deal with it. But the acting. Gary Oldman, Colin Firth, and Benedict Cumberbatch were phenomenal. John Hurt had a smaller role but commanded the whole film. Tom Hardy didn’t give his best performance, but he does paranoid well so I’ll let it slide. I’m upset at how many times Tinker, Tailor, Soldier, Spy was nominated, including for Best Adapted Screenplay, and that Gary Oldman didn’t win Best Actor. That being said, it did better adapting than most movies. I wish they would have given Connie more screen time because she is integral to the plot twist in the book. There were also some liberties take that seemed to push a social agenda, but they were small enough to ignore. Overall, I love the movie…but the book was better. Check out the book and then watch the film. Let us know which you liked better. Country Mountain girl at heart, Drew spends her free time avoiding human interaction. If you can spot the rare Drew-girl in the wild, she is generally barefoot with a book. Drew's love for reading began at a very young age. Her earliest memory of reading is memorising Brown Bear, Brown Bear at age three and 'reading' it to her parents' friends. Drew has since graduated to the likes of CS Lewis, JRR Tolkien, William Shakespeare, Jane Austen, and Brian Jacques. She hopes to pass along the love of reading to her niece and two nephews. Drew is also #TeamCap.